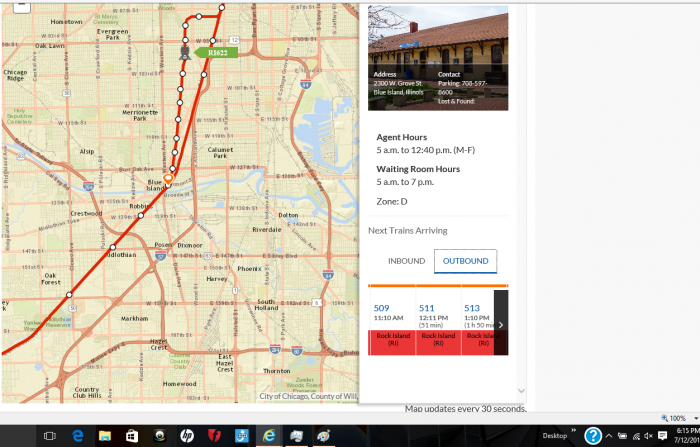 Metra has unveiled a major new enhancement to its website with the debut of the new “Rail-Time Tracker” feature. 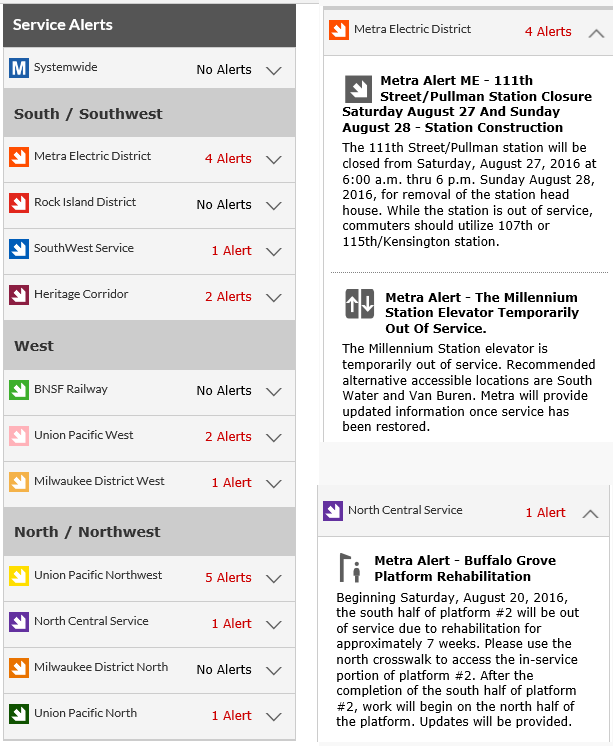 The feature, available on both the desktop and mobile Metra websites, allows riders to check the status of the next trains at every station on the Metra system. It shows the scheduled departure times of those trains in one column and whether the trains are on time or running late – and if so, how late – in a second column that shows the estimated departure. Read More"
On July 4th it is showing the weekday scheduled departures which are running on time despite the fact it is a Sunday/ Holiday service. Yesterday none of the additional trains appeared and then in the afternoon it disappeared! It isn't that major, in that all it is is a station display at the lower left corner. On the one I checked, I suppose you are correct in that it shows a train once an hour, but if it is on Sunday schedule today, it should be once every two hours. The train numbers are also way too high for the Sunday schedule. I have the feeling that this isn't much different than Pace's Webwatch, in that if midday is once an hour, all it spits out is the regular schedule for the next two trains, except today the wrong day's schedule. This may meet the legislative mandate, but as I said in another context, computerz is dumm. Having been goaded into it by a post on the CTA Tattler, you might want to read my analysis of this problem, i.e. that Metra has an incorrect calendar file. That, of course, assumes that Metra uses the GTFS format or something similar. I'll have to try Metra's train tracker out at some point. I keep forgetting Metra finally activated their train tracker service, but I just wonder if the page would load up fine with a non-iPhone/Android phone that can load up at least basic/mobile enabled internet pages(albeit barely, since my phone's browser will crash if you go to a page that's too data/graphic heavy), a la CTA's bus and train tracker? Would just be great if Metra's train tracker showed the number of the engine(s) leading/trailing that are attached to that train, but I doubt it(lol). So I knew how often(and on which Milwaukee District line) locos #613 and #614 are used in service. ...So I knew how often(and on which Milwaukee District line) locos #613 and #614 are used in service. Anyone know if the MP36PH-3S engines that were assigned to the BNSF line are out for rehab? I havent seen them in a couple of months. Both of which I saw in the Western Yard this afternoon. Train Tracker was on an iPad in the agent's window. Also there seemed to be more announcements of "the next inbound train in 4 minutes." However, I think that the trains were running 2 minutes fast. The BNSF MP36PH 402-404 moved to Milwaukee District at Western Avenue in April/May. 401 and 405 are not in service at present and were taken out of service in May (401 last seen at 47th, 405 at Western). Idea is to concentrate these engines at two locations Western Ave and 47th (Rock Island). BNSF gained 209-212 in return from MWD. 611 and 614 have been taken out of service again last month, now that the F40PH rebuild program is finished. They are both stored in Western Ave yard. Sum-Times just pointed out that Metra just upgraded its site, including maps showing progress of the trains. As indicated. you go to Maps and Schedules, pick a line, and then pick Line Map. For instance, here's the one for the ME. Inbound Train #2158 Sched. to Arrive Chicago at 9:34 PM - 8 Minute Delay. Train #2158, scheduled to arrive Chicago at 9:34 PM, is operating 8 minutes behind schedule due to waiting on other trains. The map is nice, and the website as a whole appears more organized. However, I don't like how the homepage doesn't display all the service alerts at once anymore. You have to click on each line individually, and only one line displays at once. I realize that it's probably easier now for average commuters who only care about one line, but as a transit fan I liked to see what was going on throughout the system. 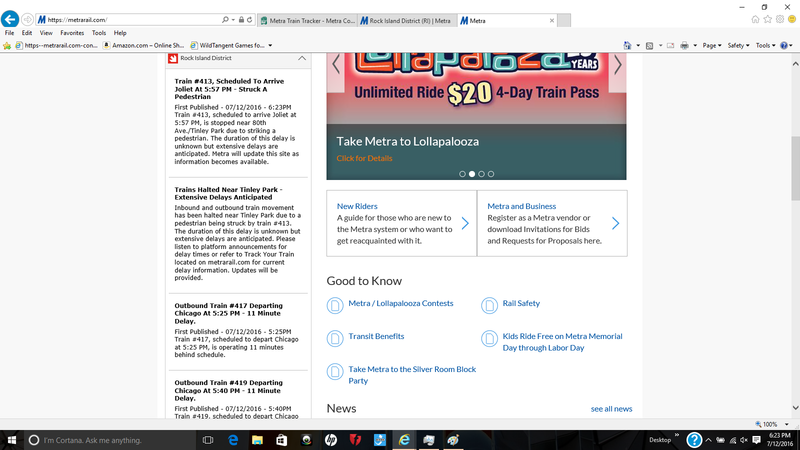 Maybe they could do something like CTA's website, where there is a status next to each line. "Normal service", "Minor delays", "Significant delays", "Major delays", "elevator out of service", "Upcoming alert", "station construction", etc. That would be more helpful to anyone by pointing out that something is going on along their line, which they otherwise wouldn't have found out about because they didn't bother to click on the line name. Cool!! But there needs to be a sb/nb designation as I don't know what is UN361, but I suppose if I had a schedule I would know but isn't that sort of the idea that this is for someone that don't have a schedule? For those with this issue I suppose they could download a schedule and then they would know what is what. 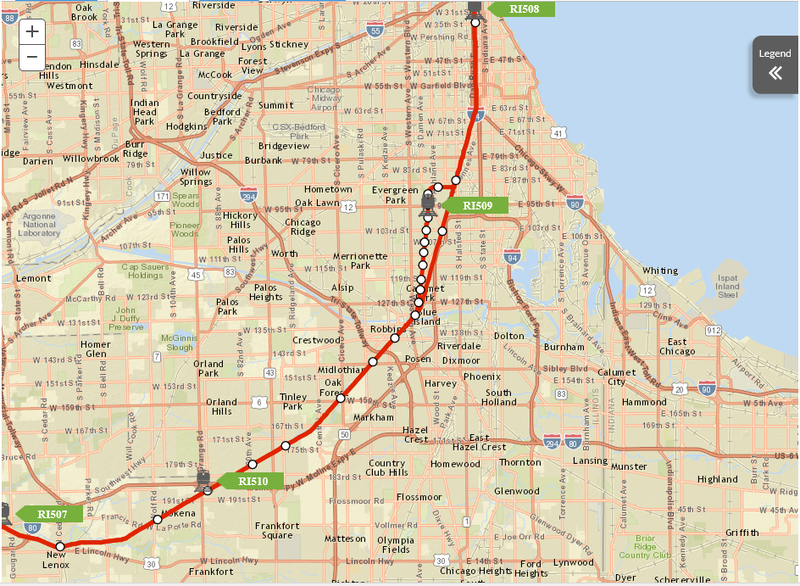 The lack of direction bothered me too, but the only map that provides it is the Route Progress and popups on the CTA map. If a train is moving, it moves pretty fast, so one can get a sense of direction that way. Except for 2158, which is still there, but I'm not going to Morton Grove to see if it is a real train. Inbound trains are even numbers and outbound trains are odd numbers. However, Average Joe shouldn't be expected to know that. Maybe they should display "inbound" or "outbound" under the train number. 1. The ghost trains that Busjack noted. It showed trains 507 through 510 in the positions where they would have been at about 10:45 AM. 2. Certain information didn't load right away. The image above shows how it looked when I first turned it on, only showing the ghost trains. When the image refreshed once, all the trains appeared in green. On the second refresh, the "alert" icon appeared next to them. On the third refresh, the background of the delayed trains changed from green to red, as shown below. 3. The supposed arrival times are way off. In the image below, it says a train is coming in 51 minutes, at 12:11 PM. That would have made sense if it were 11:20 AM, but the actual time displayed by my computer was 6:15 PM. 4. Look at the alert at top left. It says "First Published - 7/12/2016 - 6:23 PM". As the time at bottom right confirms, 6:23 was the current time. The time shown as "first published" was automatically refreshing in sync with the clock. Also, the automatic alerts for each train all said the train was 11 minutes late. A NCS train was also showing 11 minutes late. This appears to be the latest technology blunder. But why is 11 the magic number? One other thing I noticed is the map appears set up so that more information will appear if you click on things, but it doesn't work that way. You can click on the station and get information about it, as shown in #3. However, the default display of upcoming arrivals starts by showing the earliest train that day, not the next one. You have to scroll through to get that information, which turned out to be wrong. 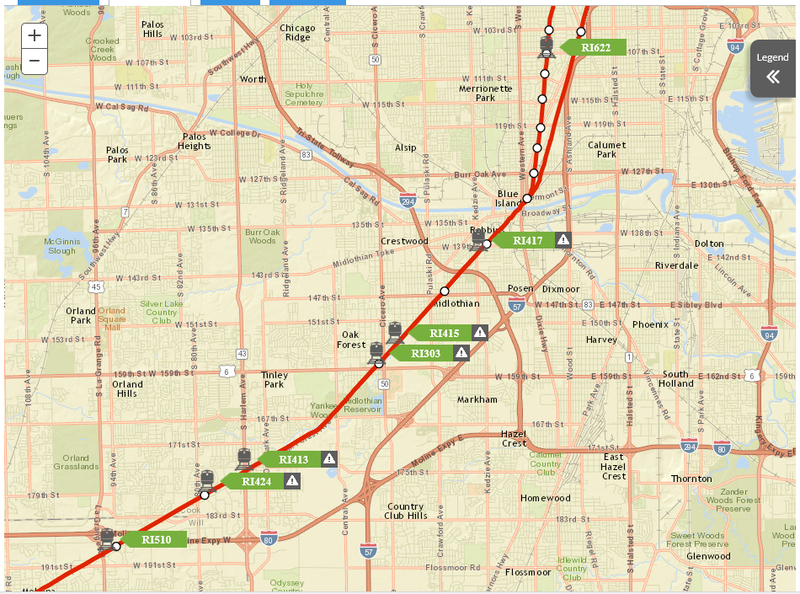 Also, it would be nice if clicking on the train icon showed a list of upcoming stops, like the CTA train tracker does. Similarly, clicking on the alert icon should show the full text of the alert. Another nice feature for the home page would be to show the alert icon next to the line name during major delay situations like this. Currently, you have no idea if there are any alerts until you click on the line name. Dear Metra Customer, We are currently experiencing a glitch in our Metra alert system, resulting in some messages about delays and the status of trains not being sent to our customers. The impact of the issue was fully evident last night after a train struck a pedestrian on our Rock Island Line and a mechanical failure delayed service on our Heritage Corridor Line and alerts failed to reach our customers. Our staff is working around the clock to fix this issue because we know our customers depend on these alerts for critical travel information. In the meantime, we ask that you visit metrarail.com to access real-time train information or use the train tracker feature available on the Ventra App. We apologize for any inconvenience you experienced as a result of this problem. We will keep you posted as this issue is resolved. However, the press release mentions that the problems were mostly related to email and Twitter alerts. They recommend using the train tracker instead, which wasn't much better, as I described above. 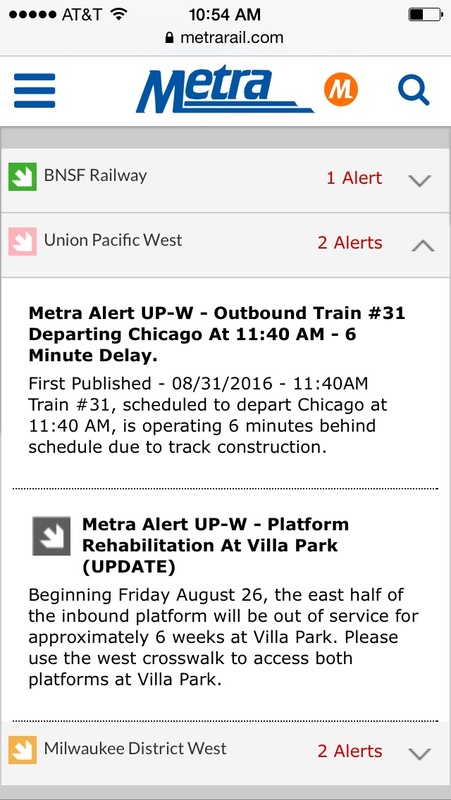 I received this in an email from Metra at 4:00PM today, Friday, July 15. "Dear Metra Customer, For the past several days, we have experienced a glitch in our Metra alert system, resulting in some messages about delays and the status of trains not being sent to our customers. Our staff has been working around the clock to fix this issue because we know our customers depend on these alerts for critical travel information. While it took longer than we wanted to resolve this glitch, we can now report that the Metra alert system is back online and fully functioning. We apologize for any inconvenience you experienced as a result of this problem. " They did some of what I suggested earlier. The website now shows the number of alerts for each line, as well as icons to indicate the type of alert. Metra is now hiring psychics to predict train delays, so the control center can issue an alert before the train departs. There have been several of these in the past week or so. That wasn't the case here or in the others that I mentioned. If it were, the cause should be listed as "late arrival of equipment". I have no explanation for this latest communication failure. It probably is both. If you weren't on the train or at the downtown station, you wouldn't know. Besides that, the only thing that would concern the average passenger is that the train is going to be 6 minutes late, although somebody better not figure on having an extra dunkaccino on the basis that the train is not leaving on time. While I wasn't on this specific train, I've seen similar alerts several times before. It seems to have been happening since the recent website "upgrades". If it is a "late arrival of equipment" issue, the alerts are in the wrong format. Since the screenshot was taken 46 minutes before departure, it would say "Train 31 will be delayed in departure... The expected delay time is 5-10 minutes". Exactly 6 minutes is too hard to predict if the train isn't nearly ready to depart. The train is not "operating 6 minutes late", because it's not operating at all. I'm now thinking that these are alerts from the previous day that, for some reason, reappeared. Usually they are removed when the train arrives at its destination or at 3:00 AM (end of the service day). Note that the time stamp in my example is the same as the departure time, 46 minutes in the future. As I've noted before, they've been trying to automate more alerts. This appears to be the result of a failed attempt to improve communication of delays. Metra has an announcement that it has contracted with Clever Devices to replace its GPS tracking and passenger announcement system, including a test of passenger counting. 1) Will it still be GPS? 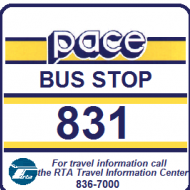 2) How does passenger counting work?